Perfect for: Readers from age 14 and Up. 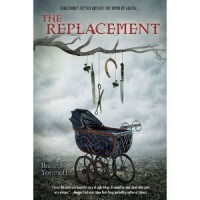 The replacement is "One of the best books I have ever read." still I have a hate/Love relation with it. You can never love it completely or hate it to the edge as it was almost perfect (for others it can be perfect but not me). Mackie is not a human; he once was but now he is one of them living among us. The people of the underworld who must sacrifice a living child to keep them powerful. Mackie is one of the teen characters that you will like but the one to love is his sister who event if she knew he is not her biological brother but still she kept him safe and alive. You also have to repeat the dark creatures because not all of them need to kill or hate; some of them need to feel loved to live. Not all what is dark is bad. I must pause now or I shall spoil the book. I am sure you shall enjoy reading it.